Anybody who’s ever played golf in Greater Cincinnati or, for that matter, Ohio very likely knows the name Joan Comisar. Now, her legacy is being further burnished at her golfing home, Kenwood Country Club. 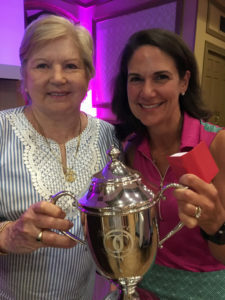 Women there will compete annually to have their names added to the Comisar Cup, which honors three flight champions in each of nine- and 18-hole tournaments that serve as the club championships. The first Comisar Cup competitions, played using a Stableford format, drew 50 participants at Kenwood on June 27-28, the first two days after the club hosted a lavish dinner to both honor Comisar and give the new event an appropriate kickoff. Former television sports reporter Dennis Janson served as master of ceremonies. The list of Comisar’s accomplishments is remarkable, especially since she only started playing at age 28 and only then because her husband, the late Lee Comisar, wouldn’t stop talking about how much he loved the game. She’s won 29 Kenwood club championships, 17 at the Springs Club in Rancho Mirage, Calif., and one at The Club at Morningside, also in Rancho Mirage. That was in 2002, two years before she was included in Sports Illustrated’s “Faces in the Crowd” feature. Her list of championships includes 10 Greater Cincinnati Seniors, five Ohio State Seniors, four Cincinnati Mets and one each of the Ohio State and Ohio State Super Senior. Her record has led to induction into numerous halls of fame, including the Hamilton County Sports and Cincinnati Legends of Golf. She also has served off the course on several boards and committees and played on Kenwood’s team for Inter-Club competition for more than 50 years. Comisar’s most memorable championship is her first Met. “I was so frightened before the first shot,” she recalled. “I was playing with Sandy Jones. It was one of those things where you just got to be kind of zonked out. I remember, on the fourth hole, there was a trench in front of the green and a creek going up the left side. I hit it into the creek. Everybody was looking for it. My sister turned her ankle. They told me to hit another one, and I got it on the green. Health issues, including knees Comisar describes as “shot,” keep her from playing as much as she’d like, but donating the Cup is just another example of her continuing to contribute to the sport. Besides the dinner, Comisar was impressed with the tournament atmosphere, which included scoreboards for the three flights, named in honor of the clubs at which she’s won championships and decorated with the logos of each club, which were located by Kenwood Director of Golf Jason Toryk. Club pro Kim Hilbert researched Comisar’s career and put together a video presentation at the dinner. Under the Stableford format, golfers receive a certain number of points based on well they do on each hole, such as one point for par and two for birdie. The idea is to finish with the highest score, the opposite of medal play. The overall 18-hole champion was Ginger Lippmeier-Suarez, while Kristie Sheanshang was the overall nine-hole champion. 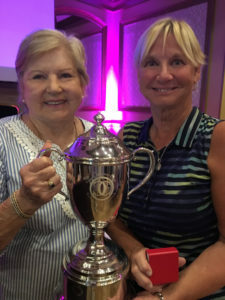 Eighteen-hole: Kenwood Flight Net, Elize Theron; Morningside Flight Net, Linda Seal; Springs Flight Net, Karen Maier; Kenwood Flight Gross, Lesli Hopping; Morningside Flight Gross, Lisa Consolino, Springs Flight Gross, Diane Herndon. Nine-hole: Kenwood Flight Net, Juanita Sullivan, Morningside Flight Net, Cheryl Chapman; Springs Flight Net, Patty LaLonde; Kenwood Flight Gross, Maria Decker; Morningside Flight Gross, Molly Gusweiler; Springs Flight Gross, Ingrid Kasten. “Flight winners received beautiful pendants,” Crilley said. Also, similar to the Masters, the overall winners will choose the menu for next year’s dinner.